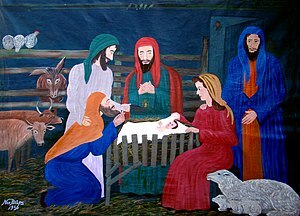 Christmas is near, the time when many religions around the world celebrate Jesus. Although I don’t consider myself a religious person in the traditional meaning of the word, I celebrate Christmas and I like to read what he had to say. In many bibles, Jesus words are highlighted in red, and although he gave many speeches during his lifetime, only a few words can be found of what he had to say, never a long written account of his speeches during that time. This is why I say that he was a man of few words, and since those words have lasted for a few thousands years, he is still a master of a timeless audience. Will continue to be so as long as bibles are printed, downloaded, and his message is preached. Personally, I think that “religion” has twisted his wisdom; however, his words still touch people in a very personal way – despite the many religious interpretations. Maybe the way he intended those words to be received by each and one of us. So in tune with the Christmas spirit, I want to share through this post, my favorite Jesus quotes; here they are. I like this one because it is all about persistence, about keeping on, and never to give up. I like this one for the obvious, but also because Jesus made a distinction between heart (feelings/emotions), soul (spirituality), and mind (brain/knowledge) – three aspects of our complexity, our being, and all should be in harmony. But not only that, after he acknowledges our nature, he tell us to love our neighbor as oursselves, hinting that we are all one of the same, all related and intertwined, and all one in God. This says it all; imagine the beauty of this existence if everyone did just that. Love this one a lot; Jesus knew how our little brains work, and he let us know the importance of living today. Even that I find this one so hard to do, it is there and Jesus wanted us to know that yes, it is not all about me, and yes, it is harder for adults to forgive, and little children forgive so easily. In that sense we must be as little children, and let go of a grudge, and keep playing together in this beautiful earth. Our human nature gets in the way, we judge what we see, hear … our five senses get in the way sometimes, and many times we must bypass them, so we don’t judge without really knowing. Jesus knew that well and he needed to remind us. Oh my God, Jesus had to tell this because we all are worry warts sometimes; I know I am, but am learning to work on this human trait that is so hard to ignore sometimes. And this is one of my very favorites, because it speaks of our true essence, of the goodness in us, of the light that is our true being, our divine essence. There are many other Jesus words that I love, but these are my few favorites and since soon it will be Christmas, what better way to celebrate it, but thinking about the meaning of Jesus teachings. Thanks for this post. One can not stand but in awe of the depth and simplicity of Jesus teaching. I always feel that the simpler the words the more scholarly the thought behind them. I takes time to reduce thoughts to a simplified form. When these words are examined in Greek and/or Aramaic they add yet another depth to their meaning. Thanks, glad you enjoyed it. I agree with you, over the years, translation has taken much from the original language meaning.